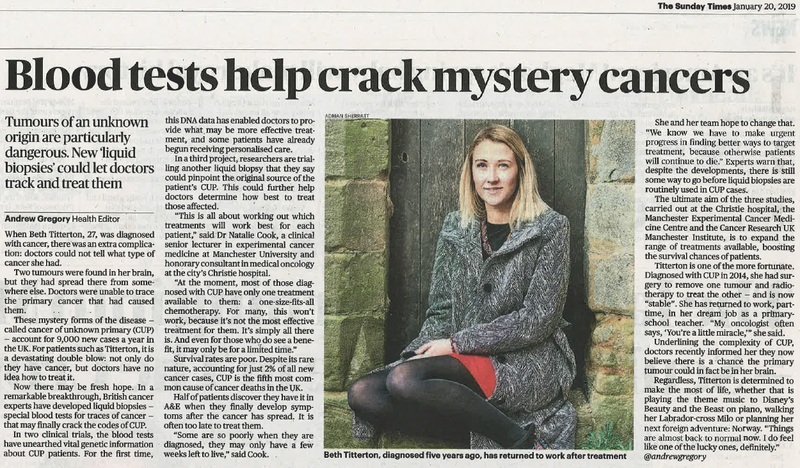 The Sunday Times article of 20 Jan 2019 – below- reflects research being undertaken in Manchester, to which we have contributed some funding. The information in the article is based on a blog prepared by Cancer Research UK which gives more detail and can be seen here . A word of caution: this is a very optimistic article but the research is only at an early stage; the value of this approach is as yet unproven. 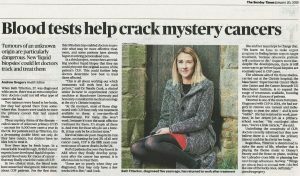 The significance, if it is proven, is not just in helping with an initial diagnosis but also in tracking the molecular changes in the cancer during treatment with a simple blood test, rather than a biopsy, that could allow treatment to adapt to the shifting target.